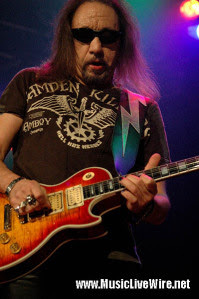 It’s been 13 years since former KISS lead guitarist Ace Frehley went out on a solo tour. What a difference time makes, and more importantly, what a difference sobriety makes. Since his last solo tour in 1995, Frehley once again donned the spaceman make up and enjoyed the incredible success of a worldwide reunion tour with his former band before egos and old demons came back. He parted ways again following KISS’ 2000 farewell tour. Despite efforts from KISS leaders Gene Simmons and Paul Stanley to get Frehley back in the band, the spaceman stuck true to the word “farewell” and has laid low until this year. Despite flubbing a few licks here and there, Frehley’s playing was top notch. He played with a sense of urgency and an intensity that had been lacking during his final tenure in KISS. He nailed all of his signature solos and had the crowd chanting his name during his extended solo following “Shock Me.” While his trademark smoking Les Paul was suspiciously absent from his solo, he made up for it by simply burning up the fretboard. He displayed the chops that made him influential to a generation of future guitar heroes. Seeing Frehley as the front man is a nice treat. His charisma and sense of humor carried the banter as he told jokes about his grandmother’s farm in North Carolina and 3-D effects of KISS’ Psycho Circus tour. He seemed to be in a fantastic mood while joking around with the crowd and his band mates. The band’s great mood fed the crowd and everyone just had an incredible time. While his former bandmates may be playing slowed down versions of their songs with replacement members donning the make up of originals, Frehley is playing like it’s 1975 all over again. The only difference is, his head is clear this time and he’s looking to the future. Simply put, Frehley delivers live.